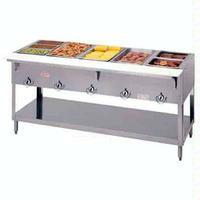 Hot food tables, sometimes referred to as steam tables, are used by restaurants, caterers, hotels, buffets, cafeterias and other foodservice professionals to maintain safe hot food temperatures. These tables hold hot food at ideal serving temperatures throughout meal service by way of either moist or dry heating, depending on whether or not water is used in the pan or well above the heat source. They are not intended to cook nor warm food from cold temperatures. Both sealed and open well steam tables can utilize moist heating, which involves using water to create steam to gently heat the pans from underneath. Water is poured into sealed well units and a food pan is set into the opening. Open well units may use wet or dry heat. If moist heat is required, a double pan system is required. A deep water pan is inset into the opening, and a shallow food pan is set above the water pan. Only open well steam tables can use dry heating, which is the process of heating the pans without water. Many options are available for food tables such as cafeteria breath guards for self service, buffet breath guards for operator service, overhead heat lamps, lights, shelves, tray slides on one or both sides, among a myriad of other options. Hot food tables may be referred to as steam tables and can be powered by gas or electricity. Varying models support wet heat or wet and dry heat. They can be used back of the house to keep food warm for serving, or front of the house for operator service or customer self-service. Some models include operator side cutting boards and individual controls for each well. Wet and Dry - the most common and price conscious model requires a double pan system. The heated wells each require a 12" x 20" water pan filled with preheated hot water, then the food pans drop into the water pans for moist heat. Food pans (full-size, half-size, one-third size) may be set directly into each well for dry heat. Smaller food pans (one-fourth, one-sixth) require additional support to avoid the pans dropping down into the wells.